1960s One Agfachrome showing a small boy sitting on the lap of Santa Claus in a Department store in the 1960s. There is a record player in the background certainly playing Christmas carols. You can also see a Globemaster airplane and other boxed military toys in the background. 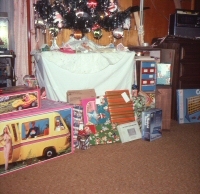 1970s 1 color transparency showing a nice pile of girls toys underneath the Christmas tree. 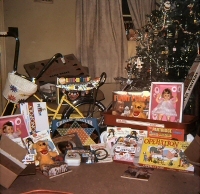 Gifts include a yellow bicycle with flowered banana seat, Monopoly, Play-Doh Funny Pumper, Winnie the Pooh, Chinese & Regular Checkers, Vanity Toy Cosmetics, Porcelain Toy Tea Set, Play Nurse Kit, Operation, The Partridge Family Sound Magazine, Nurse Play Set, Sears Red Wagon, Super Poster Kit, Dolls & Deluxe Lite Brite. 1950s-1970s 8 slides from several Christmas mornings. Most are from 1971 at Rich and Nancy's. Nice shots of some old pedal cars. 1959-1964 7 slides, most appear to be of one boy's Christmas mornings over several years, terminating in 1964 where you can see a Hasbro G.I. Joe marine action figure standing underneath the Christmas tree. April 1960 One slide from 1960 showing a boy opening Christmas presents. His most recent opens - a Scrabble game and a new transistor radio in the leather carrying case. Awesome, except that it's 1960 so what are you going to listen to? A steady diet of "Cathy's Clown" by the Everly Brothers, "Teen Angel" by Mark Dinning, "Puppy Love" by Paul Anka, "I'm Sorry" by Brenda Lee or "The Twist" by Chubby Checker. Hang on Bawh, The Beatles are just 4 years away! 1950s-1960s 13 family slides from the late 1950s into the 1960s. 1967 3 Drewry Photocolor slides from a wedding in 1967. California plates on the car suggests a West Coast wedding. 1955 6 red frame Kodachromes from a 1955 halloween party. There are two (currently inappropriate) maids in blackface. Upon closer inspection you can see that they are using black ski masks! 1977 2 underexposed Ektachromes of Christmas in 1977. The film was processed in 1978. Think about that, ye children who were born in the age of digital cameras. It used to be very common for families to develop their Christmas pictures in February-April. January 1962 7 slides from 1962 of a charming little girl and her family. I think the pictures are from Christmas 1961. Several of the shots are blurry. September 1969 Two 35mm slides showing Grandpa & Mike and Grandpa, Mike & Scott on a red Farmall tractor at the farm in 1969. 1950s 3 red border Kodachromes of a young boy dressed as a cowboy. Boots, red hat, gun, holster, rope and a western shirt as a bonus. Christmas 1964 This is an amazing photo. Sister is sitting in a beautiful child-sized dump truck (Playload Dump) with the truck set in dump position over her brother and his toy drum. Look at her face! The only thing that would have made this picture better is if there had been a load of teddy bears or Lincoln Logs in the dumper. 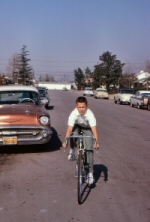 January 1962 A picture of a boy riding a bicycle down a car lined street. The tags on the Chevrolet is from California. The dealer was "R. V. Dorweiler" The other tags appear to be from California too. 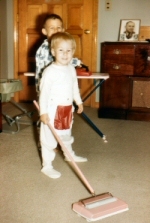 January 1961 Two young boys in 1961 posing with a carpet sweeper and ironing board. They are both pretending to be in the middle of the vacuuming and ironing. May 1968 One 1968 picture of a baby dressed in a jumper that comes with rabbit ears. This was posted in 2013 which makes this little tyke 45ish today. He/she could come to this site some day, perhaps attracted by a slide of a familiar street scene or amusement park, and never know that their toddler picture is on this page. Or that people used to dress them as rabbits. 1950s 1 red border Kodachrome showing a woman holding a baby beside a creek. February 1978 20 of the square window slides probably showing a family around Christmas of 1977. Slides are faded and frames are warped. 1967 A very charming lot of 15 family slides from 1967. The photographer had a wonderful eye and beautiful young girls for subjects. Check out the pictures. 1960s A nice lot of 70 red border Kodachromes showing a family in the 1960s. There are a few shots of a trailer parked in a lot by a river with a Abalone Pearl Jewelry sign. What appears to be initials, JHH, are on a car. 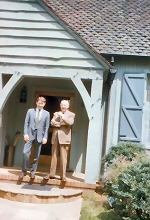 1950s 1 red frame Kodachrome of a man and his son in suits, standing on the porch of their home. Februay 1960 One picture of a father feeding a baby its bottle in 1960. 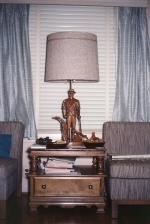 January 1962 Three slides that all include a figure lamp similar to the Johnnie Walker lamps. I think it depicts a farmer or pioneer. The picture of the man and boy are blurry. The solo shot of the lamp is good. click links for more pictures Christmas Tree, The Lamp! January 1965 A picture of 4 children posed together - probably in December of 1964. The slide is labeled "Grandma's Party." 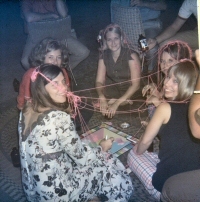 1960-1972 About 106 slides depicting family graduations, wedding, Christmas, vacations. Check out the 42 samples. Great lot! August 1966 Thirteen Kodachrome slides depicting a family spending time in their backyard. Children playing in a backyard table and eating at the special kid's table. 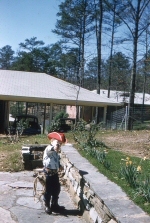 1950s 1 faded red frame Kodachrome of a woman and child near an old Plymouth looking at green hills. 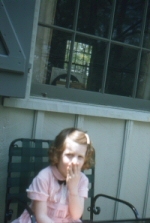 July 1961 One picture of a young girl sitting on a living room couch in 1961. 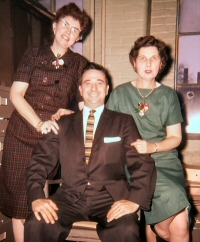 January 1962 Two women posing wth a man. Everyone is dressed in formal clothing. July 1960 Thirty vintage slides of a vacation to Jemez Springs, New Mexico. Includes nice pictures of the Ice Palace, the Kiska Store & the Ice Burg Cafe. June 1967 29 slides. A few are damaged. Scenes include a wedding at the All Saints Anglican Church, Sault Memorial Gardens, the Diplomat Hotel, Steamboats, the Esso '67 Roadshow Grand Prize (a '67 somethingorother automobile on a trailer), misc. buildings, a shell station and more. July 1967 25 slides of a wedding, a Chief Shingwauk tour boat in Ontario, a Niagara Falls double decker bus. A few of the slides are damaged or too dark. 1961 Twenty two 35mm slides of a Florida vacation. Pictures include the Stephen Foster Memorial, a roadside Storybook Land/Enchanted Forest Mother Goose park, a motel swimming pool, people, buildings, nature scenes etc. A few of the slides are damaged. 1960s 30 misc family vacation/travel slides. Views include the Murat Hotel in Paris?, people in a stadium, a vintage car in the driveway, Washington DC. Many of the slides have damage or are poor shots. 1962 48 slides from January, September and October 1962. Some slides are damaged. Subjects include an elderly couple's cruise - pictures of ships, an event at Lion Auto Supply, London, Seven Falls, Christmas tree in the home. October 1973 20 misc slides from 1973. Scenes include the neigborhood, the family, a cruise ship, a dam? and exotic birds. January 1962 Two 35mm slides of a young girl in 1962. One picture shows her on green tricycle with a red bow on it. 1950s 3 red border Kodachromes of a young girl in the 1950s. May 1961 6 vintage slides showing a boy, his mother and a Siamese cat playing a table top hockey game. 1960s-1980s 80 slides of family vacations, holidays, street scenes etc. 1960s-1980s A Kodak carousel box full of loose slides from the 1960s, 1970s and 1980s. There are a smattering of 1950s and maybe 1990s in the lot. There may be 50-75 professional souvenir slides. Lots of nature photos. May 1978 19 slides from a Halloween costume contest processed on May 1978 but were probably taken in October 1977. 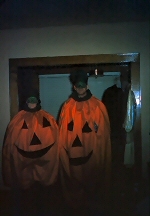 1960s One photo of two adults dressed as jack-o-lanterns.